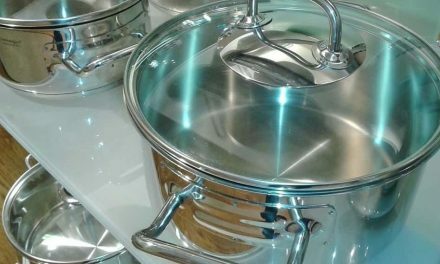 When we think of pots, pans, baking pans and casserole dishes we often traditionally think of shiny silver or copper metals. But these days, cookware takes on many bold colors and textures, thanks to the rise in ceramic cookware. The best ceramic cookware sets are sturdy, non-stick, attractive, and durable against all kinds of cooking adventures. They consist of a versatile selection of items such as small saucepans, casserole dishes, larger pots, and frying pans. But let’s backtrack for a moment and learn a bit more about ceramic before we get into our list of the best ceramic cookware sets. Non-stick cookware such as Teflon has come under fire in the past, being criticized as unsafe due to chemicals leaching from the cooking surface and into the food. Sounds nasty, doesn’t it? Luckily, ceramic cookware does not have this problem. 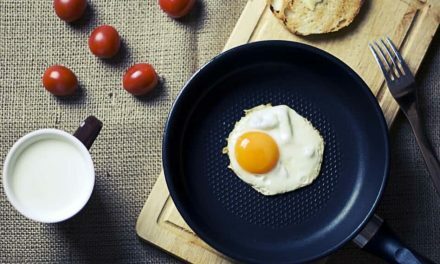 Ceramic cookware offers a non-stick surface without the risk of chemical contamination. 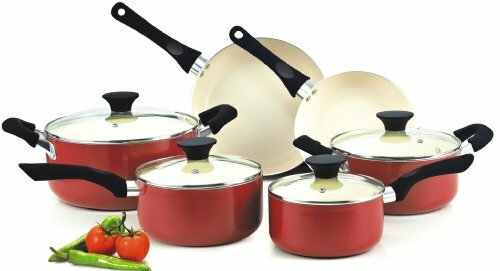 You can get 100% ceramic cookware or cookware which has a metal base with a ceramic non-stick coating, both of which are great. The cookware is fired in a kiln at an eye-wateringly high heat to set the ceramic hard as nails. Some ceramic cookware sets are suitable for oven use, but generally only up to 350 degrees Fahrenheit. Some are suitable for all cooking surfaces, but some are not safe for induction cooktops. Enough of the details, let’s get stuck in to the best ceramic cookware sets! This is by far the most affordable ceramic cookware set on our list, and I’d say it’s the best ceramic cookware set out there for small budgets. The Cook N Home Nonstick Ceramic Coating Cookware Set comes in two colour options: bright green or red. We love these options as they offer something a little more fun to brighten the kitchen if you’re that way inclined. You get two saucepans, 1-quart and 2-quart, a 3-quart casserole, a 5-quart dutch oven, an 8-inch fry pan and a 9.5-inch fry pan. It’s one of the best sets for both value and safety. The handles are designed to stay as cool as possible so you don’t burn your hands when handling the pots and pans. This set has everything you’ll need for most recipes, so all you need to buy to supplement it is an oven-safe dutch oven and a few baking pans to cover all bases. In this set, all pots and pans except the fry pans have tempered glass lids. These are handy if you like to keep an eye on your dishes as they cook. Do be aware that this ceramic cookware set isn’t compatible with induction cooktops, but it’s one of the best ceramic pots and pans sets for gas stovetops. The Cook N Home Nonstick Ceramic Coating Cookware Set is one of our picks because it’s affordable, versatile, and hard-wearing. We like the range of cookware sizes you get, from small saucepans to a large dutch oven. The only drawback is that nothing is dishwasher safe, but this isn’t too much of an issue, as the non-stick coating makes for easy handwashing anyway. It’s the best ceramic cookware set for people on a small budget, with a gas stovetop and a penchant for hand washing. This set offers a great option for students or first-time homeowners who need an affordable ceramic cookware set to get themselves started. Also be aware that the Amazon listing states that this set cannot be used in the oven, when in fact, it can. The manual says that the Cook N Home Ceramic Coating Cookware Set can be used in ovens if the temperature doesn’t exceed 350 degrees Fahrenheit. We think this is great news, as it ramps up the versatility and cooking possibilities provided by this affordable set. This cookware set has a bright and stylish design. The Vremi 8-piece ceramic coated set is a perfect option for people who want a bit of fresh color added to their kitchen. 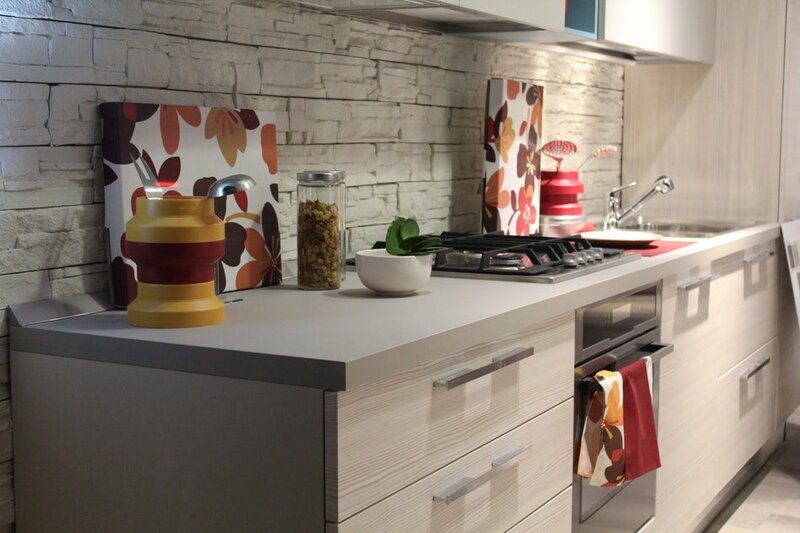 You can choose from blue, green and yellow outers, all with white interiors and lids, and wooden handles. This set is great if you have a preference for a ceramic coated set as opposed to 100% ceramic. The base is made from die-cast aluminum, with a ceramic coating designed to be non-stick and hard-wearing. This set has been designed for safe handling, with wooden handles which stay relatively cool compared to metal handles. One of the best features is that this set is dishwasher safe, so you can let the dishwasher handle the clean-up after a big cooking session. But more importantly, what do you get in the set? You get a 9.4-inch frying pan, a 10.1-inch frying pan, a 3.7-liter casserole, a 2.7-liter dutch oven, and a 4.7 dutch oven. The casserole and dutch ovens all have lids with wooden handles. The great thing about the frying pans is that they have a special curved shape which makes them ideal for flipping pancakes and omelets. This set isn’t oven safe, but it is safe for all cooktops including induction. This is one of the best ceramic cookware sets for people who want a bright new set to light up their kitchen. It’s for people who prefer to use the dishwasher to clean their cookware, and perhaps they have an induction cooktop and require a compatible cookware set. The price is great, and the design features make this cookware set easy and user-friendly. It doesn’t come with pots and saucepans, so do be aware of that before buying. We think this is a great gift idea (or as a gift to yourself!) for people who already have decent pots and saucepans but need to add frying pans and a dutch oven to the collection. The aesthetic is classic, fun, and even a little bit farmhouse-chic with the wooden handles and creamy white lids and interiors. We think it’s the best ceramic cookware set for stovetops, and for people who like to incorporate their cookware into the aesthetic of their kitchen. This set is one of the best ceramic cookware sets for smaller budgets, oven use, and making soups and stocks. Cuisinart is a trusted brand, and their 10-piece ceramic cookware set is no exception. 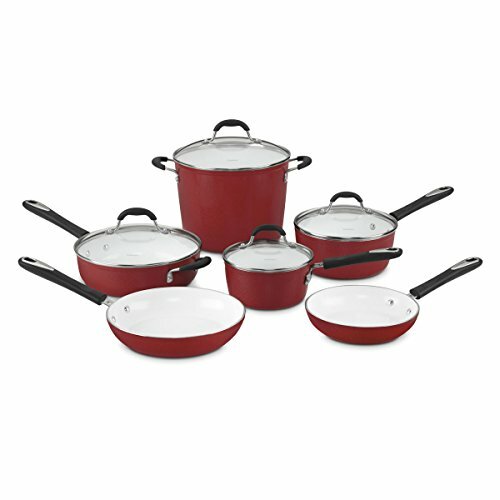 This set has an aluminum base with a non-stick ceramic coating, designed for even heat distribution. This set is a little more versatile than the other two in the list, as it has a stockpot added to the mix so you can make large pots of soup or boil whole chicken carcasses to make stock. The entire set consists of: an 8-inch skillet/fry pan, a 10-inch skillet/fry pan, an 8-qt stockpot with lid, 3-quart saute pan with lid, 2.5-qt saucepan with lid, and a 1.5-quart saucepan with lid. 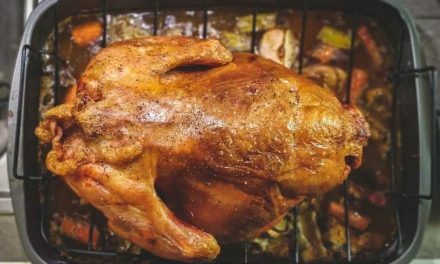 A major bonus is that these items are all oven safe, as long as the oven temperature isn’t hotter than 350 degrees Fahrenheit. This means you can keep food warm after cooking on the stove, or give dishes a last blast of heat before serving. One of the nicest touches is the silicone handle on each piece, ensuring a comfortable, firm grip and no scalding hot metal to touch. It isn’t dishwasher safe, but it’s easy to clean due to the non-stick surface. 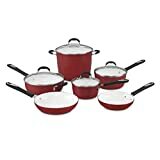 The price of this set is surprisingly low, considering the fact that you get an entire set for the price of one item from other brands (For example, one Scanpan pot or pan would cost you at least as much as this entire set). This is one of the best ceramic cookware sets for variety and versatility. It can be used on all cooktops, and even in the oven under 350 degrees Fahrenheit. It would be a great gift for someone who is setting up their first kitchen, as it has everything they need, from a stockpot to a small saucepan, with two frying pans in the mix. The price is pretty great for what you get, and the little touches such as silicone handles and durable fixtures really provide value for money. It’s not dishwasher safe, which is common for ceramic cookware care, but it’s easy to clean by hand. A great set with beautiful color choices and a durable design. One of the best ceramic cookware sets for all cooktops, ovens, and lower budgets. The second to last set on our list is the best ceramic cookware set for overall versatility, ease of use, design features, and compatibility. This set is made in Italy and has a super-slick aesthetic and shiny accent. It is one of the most expensive on the list, but I think it’s completely worth it. The aluminum base is nice and thick so heat is distributed evenly, and the ceramic coating offers non-stick ease. The exterior of this set is a shiny, classy black shade, with a creamy white interior cooking surface and polished stainless steel handles and lid rims. In the set, you get an 8-inch fry pan, a 10-inch fry pan, an 11-inch skillet with lid, 1.5-quart saucepan with lid, 3-quart saucepan with lid, and a 5-quart dutch oven with lid. I really love the handles; they are made from shiny stainless steel, but have black soft-grip panels on the front and back for a sturdy grip and protection from heat. The handles also have holes at the end so you can hang your ceramic pots and pans on a hook if that’s your style. I’m impressed that this set is both dishwasher safe and ovenproof (up to 350 degrees Fahrenheit). I like that the deep skillet has an extra handle on the opposite side of the main handle, so you can lift it safely and securely out of the oven without trying to balance a heavy, hot skillet with one handle. 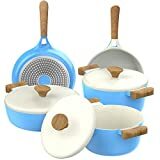 This is the best ceramic cookware set for you if you need a set which is compatible with all cooktops, can go in the oven, is dishwasher safe, durable, safe, and you don’t mind paying a higher price. This is definitely the best ceramic cookware set for versatility. You can pop the pieces into the oven to keep food warm or even complete the cooking process, then throw them in the dishwasher when you’re done. It’s an incredibly well-designed set, with intelligent, ergonomic handles and tempered glass lids. It’s a little more expensive than the Cook N Home, the Vremi, and the Cuisinart but it’s definitely worth the cash. One of the best ceramic cookware sets for durability and versatility. The final ceramic cookware set in our list is one of the most expensive, but it is very highly rated and extremely well made. GreenPan is a brand which is dedicated to healthy, non-toxic, safe kitchenware, they make some of the best ceramic cookware sets for health-conscious consumers. This set has a super-tough, hard anodized aluminum body, which means that the aluminum has been treated for maximum durability. The ceramic coating is very hardy and can withstand metal utensils, as well as being non-stick and free of toxins. The handles are made from stainless steel for durability, and have been designed with a special shape especially for keeping heat to a minimum to protect your hands. You really get your money’s worth with this set, as it is both ovenproof and dishwasher-safe, making it one of the best ceramic pots and pans sets for ease of use and versatility. With this set you get: an 8-inch frying pan, 9.5-inch frying pan, 11-inch frying pan, 1.5-quart saucepan with lid, 3-quart saucepan with lid, 3-quart saute pan with lid, and a 5.5-quart casserole with lid. There is a little bit of controversy in regards to the lid. Some people have received tempered glass lids, while others have received stainless steel lids but wanted the glass lids. Just make sure you know which one you’re getting before you purchase, to avoid disappointment! Personally, I like the stainless steel lids the best. This is one of the best ceramic cookware sets for durability and versatility on a higher budget. It is oven safe, dishwasher friendly, extremely durable, and has a wide range of versatile pieces for all kinds of cooking. You can make a little omelet in the smallest pan, or a large, slow-cooked meat dish in the 5.5-quart casserole dish. 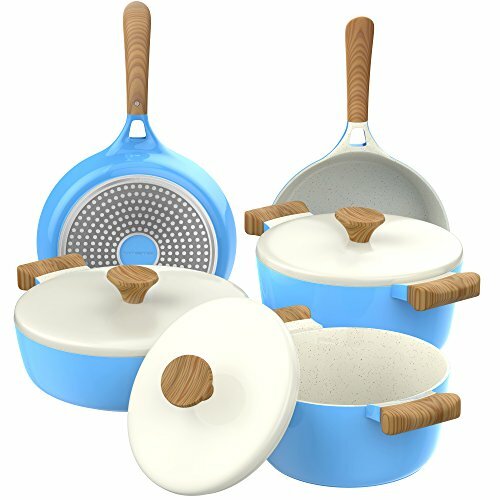 I think this is one of the best ceramic pots and pans sets for anyone wanting to invest in something they will have for years to come, with the knowledge that they’re using a safe and healthy product. Even though the cost is one of the highest on this list, it’s actually extremely affordable considering how expensive some other high-end sets are. You’d probably pay the same amount as this entire set for one large pan or pot from other, more luxe brands, so the price should be put in perspective. One of the best ceramic cookware sets for all cooktops, ovens, and lower budgets. The best ceramic cookware sets are durable, easy to clean, and have been designed with safety in mind. 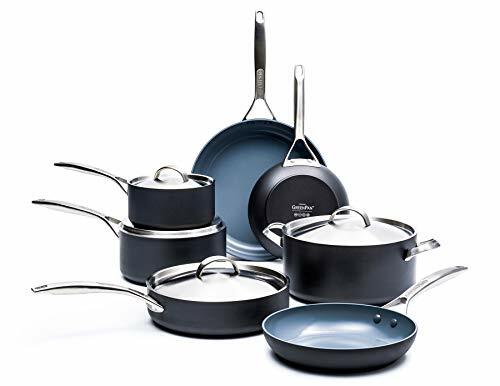 They have a sturdy, thick, aluminum base with a non-stick ceramic coating free from nasty chemicals.All of the best ceramic cookware sets on our top-5 list check these boxes. Some also offer the versatility of being oven safe, and others are dishwasher safe too. I don’t think these features are crucial for everyone, it’s totally up to personal preference. You may prefer the hand wash method for your ceramic pots and pans care and cleaning, as your dishwasher (if you have one) may not have enough room for bulky items. You may not make many dishes which require oven cooking and prefer to cook solely on the stove. All of the best ceramic cookware sets on our list don’t contain nasty chemicals to leach into your food. Most of them also have handles which have been intelligently designed so you don’t burn your hands when handling the dishes. Some have silicone handles and others have special contours for stopping the flow of heat. When choosing the best ceramic cookware set for you, think about what pieces you already have at home, and aim to fill the gaps. You may already have some great saucepans but you need frying pans and a casserole dish. Or, you may have some trusty frying pans but really need a couple of saucepans in various sizes. Alternatively, you may be in need of everything! Perhaps you’ve had a clear-out, or are moving into a fresh new kitchen and want to fill it with all new items. In which case, go for it and extend your budget as far as you can so you can get the most comprehensive collection you can afford. 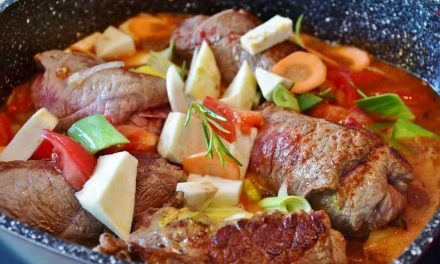 Set out your budget, figure out your color and aesthetic preferences, and be clear on which kinds of cooktop you need your cookware to be compatible with. This way, you’ll find the best ceramic cookware set to suit you.